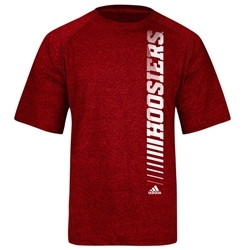 ADIDAS Heathered Red INDIANA "Vertical Stripes" Short Sleeved Climalite Anti-Microbial T-Shirt . Heathered Red 4.7 oz. 100% polyester tee with a soft feel. Screen printed HOOSIERS printed vertically down the front. Unisex (mens) sizes.